In late 2012, Toledo Zoo contacted our company looking for an adult saltwater crocodile for their forthcoming Wild Walkabout exhibit. They weren't looking for a particularly massive one, only about 4 metres (about 13 feet long). I figured we could do a bit better than that. It just so happened that I knew of an awesome 5.2 m (17 ft) saltwater crocodile that was whiling away the days in a muddy pool in captivity, an animal that had been removed under license as a "problem crocodile" from a landowner's property a couple of years earlier. What better role than as an ambassador for how awesome crocodiles are (and how many big crocs there are in the NT!) for Toledo Zoo? It didn't take long for Toledo to upgrade their ambitions, and so began the long process of arranging the transport of a massive crocodile halfway around the world. We've done this before several times, but each transport presents its own challenges. The main priority is to make sure the crocodile is happy and has a stress-free journey, something we've gotten down to a fine art. In fact the only issues were some last minute bureaucratic mix-ups, but these were sorted in the nick of time and it all went as smoothly as could be expected. "Baru" (as he is now known) is happily exploring his new million-dollar facility at Toledo Zoo. I think most of us would be quite happy with a million dollar home. So now you have an excuse to visit Toledo and visit Baru. The rest of the zoo is also very good, I was really impressed with some of the innovative designs and behavioural enrichment ideas that I saw, and their conservation breeding program is world-class (eg. Kihansi spray toad reintroduction). Here's the news story that the Toledo Blade published which shows some of the transport and offloading process. They got a few figures wrong, including the fact that the journey actually took over 50 hours, not 30 hours. They also didn't mention the part on the 15 hour international flight where the captain announced to the entire passenger compartment that they were sharing a flight with a very large saltwater crocodile. There was audible gasps. Dr Britton, so are you taking measurements of these other very big (>5 m)salties? It would be great to see a paper on this subject, with a published compilation of measurements of these really big living crocs, beyond anecdotical data and museum specimens. Did you read the Dec 2012 Herp Review paper on Lolong? There were several other large croc measurements in there. However, I took out a table summarizing all the large croc data because I felt it would work better as a separate paper. Until then, the best summary / list available is in Rom and Nikhil Whitaker's paper "Here be Dragons" which is here. Is Baru staying in Toledo permanently? ? I live in Windsor, Ontario, Canada about an hour and twenty minutes away and I'm hoping to make it over to see him, just wondering if I have to put a time limit on going to see him..
Dr. Britton you are my hero!! Colin, yes Baru is staying there permanently. He's definitely worth checking out when the exhibit opens in just under a month's time. Do you know of any documentaries made about lolong and where I can find them..and actually any documentaries on saltwater crocodiles, I cant get enough..
Hi Colin, the one I was involved with is called "Monster Croc Catch" on Nat Geo Wild, where we measured Lolong for Guinness. I believe Animal Planet also shot one after us, but I can't recall the name of it. There may be more. I have no idea how to catch these shows anymore, when I was in the US recently each of these channels just seemed to be devoting entire days to a single show (usually involving killing something) which gets old fast. Ha, I've done it again. Its "Monster Croc Hunt". Most documentaries these days about crocodiles usually involve some combination of the words "Monster", "Killer", "Hunter", "Frenzy" and "Deadly". There's a decent series being run on Nat Geo Wild at the minute called Croc Catchers featuring a team of rangers dealing with potential problem crocs in Darwin. It's a great watch and the team is headed up by Tommy Nicholls who, unless I'm mistaken featured on an early croc log podcast? Worth checking out though if you haven't already. Yes, I interviewed Tommy for an early podcast. I acted as scientific consultant for the series, reviewing the scripts for factual errors, and while I haven't seen the actual show (I was away while it aired here) I've heard good things about the end result. Tommy seemed pretty pleased with it, especially as the film crew got pretty lucky being there are the right time for a range of different incidents. Check out this skull from the Omo River, they say its ancient, looks modern...any thoughts? So...three days of non-stop research into giant crocodiles, and last night just before hitting bed, Animal Planet shows the documentary made of Lolong. INCREDIBLE. Missed the first five minutes, got the rest. I was stunned for words, they showed some massive crocodiles in different shots, the original footage of Lolong's capture and then the bombshell...a mobile phone capture of what looks to be a literal dinosaur, with a back that looked 5 feet wide. They chase it at the end, where that girl Rowena was killed. Stuff of nightmare is all I can say. In all my years of wildlife research, nothing felt so frightening than the eye glow of the croc at the last part, being focused on the men. Ridiculous to say the least. I always believed such giants existed, from first reading the Bhitarkanika records as a child, to the giants that live in Eastern Africa and the records from man eaters killed in South East Asia. I have still been unable to find the lolong documentary. ..I'm dying to see it!! I too have been doing reaearch into giant crocs! It was sheer chance that it showed on AP. Have tried locating it on Google, in all honesty, it scared the life out of me. How the people move around Lake Mihaba in such tiny boats amid such horrors is beyond me. The picture of the bigger croc is immense, although blurred and grainy, its is just freaking madness. If it was the same one chased at the end, like all smart giants, it will probably disappear knowing what humans are capable off. 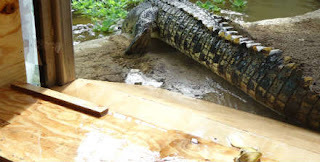 Most biologists never believed that true modern giant crocodiles existed, yet there are records of 19 and 18 footers taken in Lake Chamo and Lake Turkana, Ethiopia, trophy hunts on AfricaHunting.com. Those crocodiles pale in comparison to Lolong, Gustave and a handful of others that exist around the world. Have a look at this. That's a full grown wildebeest, at the bad end of a Grumeti croc. Possible 17" plus. I have been searching for the documentary since I read about lolong..no luck though. One day! Supersize crocs - PBS documentary with Rom Whitaker (also featuring Adam Britton) in which he searches around the globe for giant crocodiles. MonsterQuest - Killer Croc; History Channel docu with Rom Whitaker. They'll search for, and find, the giant crocodile of Bhitarkanika National Park. Dangerous Encounters - Monster Crocs; documentary with Brady Barr searching for large crocodiles. He captures an 18 feet Nile Crocodile. Croc Ganglands; National Geographic Wild documentary about a very large Nile Crocodile. They claim he's 20 feet, but he looks closer to 18 feet. And ofcourse the two Lolong documentaries; Man Eating Super Croc of Animal Planet and Monster Croc Hunt of National Geographic. All of these documentaries are available on the internet. I have seen all except the 2 on lolong..I can't seem to find them..if you know where I can find them please let me know..possibly include a link..much appreciated.